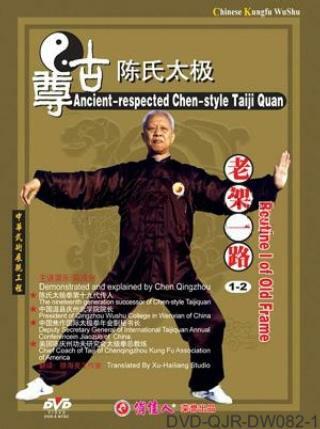 The Chen-style Taiji Quan Old Frame also called Big Frame, was created by Chen Chang-xing, the 14th successor of Chen family. Its ancient characteristics are retained completely, so it is also called kung fu frame. The routine I of Old Frame mainly emphasizes gentleness but also contains an element of hardness within. Its characteristics are: large movements, agile and steady footwork, naturally erect posture, internal energy governing the body, with the chan-si-jin (spiraling strength) as the core, the waist as the central axis of movement, and each separate movement linked together in a continuous whole. When movement commences the whole body is set in motion, when movement ceases the entire body is still. All the movements in the routine are performed continuously like floating clouds and flowing water. When applying force, one does so with a relaxed, active and elastic type of strength, and with an unbroken continuity of energy.